Mike Cohen visits with Mutsumi to discuss the decline of once-great print publications such as the Canadian Jewish News. A few words about the upcoming municipal election, at least where our area is concerned. One incumbent CSL councillor deserves re-election, absolutely. Glenn J. Nashen in District 6 is a pretty incredible guy, all told. He is hard-working, handling his municipal duties after long, tough days as the communications director at the Jewish General Hospital. He is an old time volunteer EMS first responder, having done it since the time the organization was known as EMO. And he does a remarkable job handling the public safety portfolio for the city. He is also married to a medical doctor I know and admire, Judy Hagshi, and has a beautiful young family. Mike Cohen is my man in District 2 and he’s got my vote till the cows come home, but if I lived in Nashen’s area, there is no one better as far as I am concerned. Ditto for Ruth Kovac in District 8, another councillor who gets far too little public recognition for her hard work. Over in NDG, I must say I LOVED the work perennial politician Warren Allmand did as a Montreal municipal councillor. If all politicians had his work ethic and sense of honesty, period, there would be none of the laziness and poor politics fostered by far too many of our representatives in the arena, at all levels. But I have a feeling that party nominee Susan Clarke would be a tremendous choice for the office. Chair of the CEDC (Community Economic Development Corporation), Ms. Clarke has a winning attitude and a penchant for really listening to people when they speak. She has also fostered a wonderful family with husband Paul Shubin, a key staffer at Loblaws on St. Jacques. Her son James, a longtime paramedic, was my instructor at EMS Cote St. Luc and he’s learned his commitment from somewhere. Clarke is my choice, but I can’t vote. You can. As far as Hampstead is concerned, I have two things to say. I think Bill Steinberg is the real deal, an honest, hard-working leader who has battled adversity time and time again and should be voted to another term as Mayor. And come on, Dr. Phil Gordon! If you lose the election, ya GOTTA contact the Larry David people about working as his double! Congratulations to Cote saint-Luc volunteer Citizens on Patrol Team Leaders Gerry Segal and Mike Litvack once again.Their observant surveillance techniques and quick action may have averted a tragic outcome last week for a 76 year old Smart Avenue resident. The dynamic duo were on late night patrol when they spotted movement in the snow on a poorly lit walkway. It turned out to be a woman who had fallen about 15 minutes earlier in the snow near the entrance to her house. She was clawing, bare-handed in the snow but she had little strength in her legs and couldn’t get up. Mike and Gerry asked if she was in any pain and then helped her into her home, keeping her cold hands covered. Turns out she was diabetic and was going to miss her insulin shot had the pair not rescued her from the snow. Mike and Gerry’s keen eye and quick action in providing crucial assistance and very good care may well have averted a tragic outcome. They were at the right place at the right time. For that we can be grateful. Bravo boys! You inspire all our volunteers to keep their eyes wide open and offer a helping hand whenever needed. Cote Saint-Luc volunteer EMS First Responders are lifesavers day in and day out. Recently a 70 year old man at the Post Office suffered a sudden cardiac arrest. Bystander CPR was commenced immediately by a cardiac surgeon. Within moments of the 911 call CSL Dispatch alerted the EMS crew as well as an off-duty EMS volunteer, Lieutenant Howard Wong, who arrived in seconds. EMS was close behind and immediately hooked up their defibrillator, gave two shocks prior to the arrival of the ambulance and resuscitated the patient. The man started breathing on his own and was transported to hospital. A great success by our local lifesavers. Kudos to volunteer Citizens on Patrol team leaders Gerry Segal and Michael Litvack who came to the assistance of a resident whose car died a block from his Eldridge Ave residence. It was a cold, foggy and rainy night a few weeks ago and these two vCOPs stayed with the disabled vehicle for one hour allowing the resident to run home to call a tow truck (and answer the call of nature too). We are looking for more kind and considerate volunteers for our next training session beginning in March. Info:514-485-6800 or visit www.CoteSaintLuc.org. 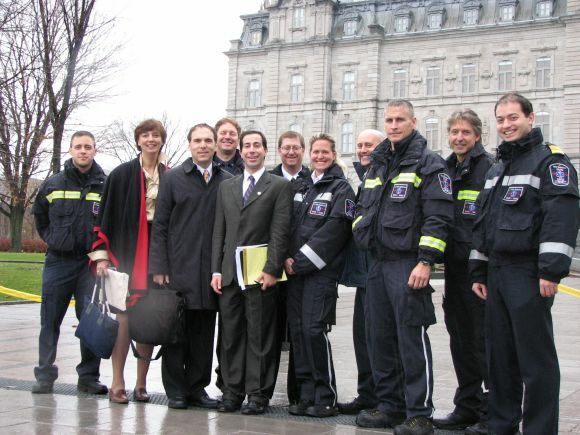 Bravo to Cote Saint-Luc EMS volunteer medics. Last week crews responded to an amazing five emergency calls in under one hour! These calls included a respiratory distress, chest pain, blood loss during pregnancy, fainting, and blood in the urine. These are priority 1 and priority 2 calls, uniquely responded to by CSL first responders. When you see an emergency vehicle approaching with lights flashing you are required to pull to the right and come to a stop until the vehicle safely passes you. Watch where you park! A parent decided to block a driveway to run in for just a minute to drop off their toddler at school. This insensitive driver was more concerned about his or her own comfort than the obvious infraction of blocking someone’s driveway. Moments later, the resident loaded his just-about-to-deliver wife into the car to dash off to the hospital and was now trapped in his driveway. Please think twice and stay clear of driveways, hydrants, crosswalks and handicap parking spots. Public Security and Police may just hand over a much deserved ticket next time. Another drowning in a Cavendish condo. Never, ever swim alone!